Born in Yorkshire of Scottish parents, he spent the most memorable years of his childhood in the west of Scotland. McIntyre Studied painting under James Wright, R.S.W, at Garelochhead. Qualifying as a dentist in Glasgow, he remained in that profession, working in the army and then in the school service until the age of forty, when he left dentistry to make a living as a full-time painter. In the late 1950's McIntyre moved to North Wales. 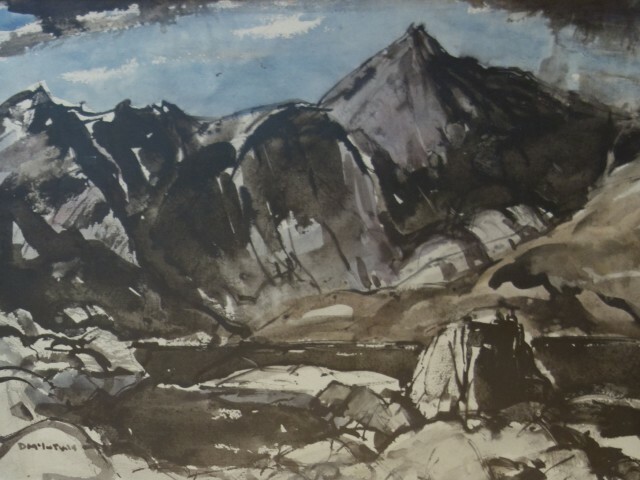 He was a member of the Pastel Society, Royal Institute of Painters in Watercolour, Royal Society of Marine Artists, and for many years until his death, The Royal Cambrian Academy. The Royal Academy, London; Thackeray Gallery, London; Albany Gallery, Cardiff; The Royal Cambrian Academy, Conwy; The Royal Scottish Academy, Scotland; Racines Gallery, Brussels. H.R.H. The Duke of Edinburgh; The National Library of Wales; Newport Art Gallery; Arts Council of Wales; Welsh Contemporary Arts Society; Kirkaldy Museum and Art Gallery; USA Embassy, London.